2. Heat 3 – 4 tbsp coconut oil in a pressure-cooker or a deep pan at medium-high heat. Add the ground ingredients numbered 2, enough salt and saute well until golden brown (take care not to burn). It will take at least 30 – 40 minutes (I did this step in a non-stick pan in order to minimize the use of oil). Bring down the flame to low. 3. Add the spice powders numbered 3. Saute for about 5 – 6 minutes or until their raw smell leaves (take care not to burn the powders, you can sprinkle a little water in order to prevent them from burning). Add chopped tomato pieces. Saute really well until tomato gets mashed up completely and oil separates. 4. Add 1/4 cup hot water. Mix well. Add the chicken pieces, enough salt and mix everything well so that the chicken gets well-coated with the gravy. Add 1/2 cup hot water. Close with the pressure cooker lid (you can use a regular vessel instead). Pressure-cook for 1 whistle. Switch off the flame. Set aside for 10 – 15 minutes or until the pressure releases. Open the pressure-cooker. Check for salt and adjust. The curry will have a thick gravy, if its very thick, add 1/2 cup hot water, bring to a boil and cook for a few more minutes. You can either add 1 tsp coconut oil now or season it with mustards, dry red chilies and fried pearl onions instead. 5. Heat 1 tsp coconut oil in a small pan. Splutter mustard seeds and fry dry red chilies and curry leaves. Pour over the prepared curry. Close with a lid for 10 minutes. Open and mix well. 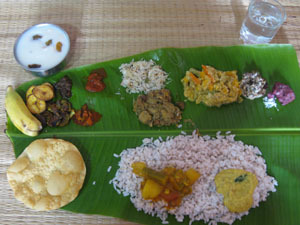 Serve with rice, Kerala porotta, chapathis, idiyappam, appam, puttu etc. 1. This is an easy peasy recipe where we can avoid the marination and slow-cooking – everything can be done in the pressure cooker. This curry is perfect for making yummy Kerala style chicken biriyani. Add chopped mint leaves once the curry is done (no need to season it with mustards and dry red chilies). Use 4 cups of basmati rice for 1.5 – 2 kg chicken. 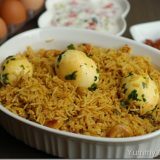 Prepare the rice and layer the biriyani as explained in this biriyani recipe. 2. I did the first 3 steps in a non-stick pan in order to minimize the usage of coconut oil. You might have to add extra oil in between to prevent the onion mixture from sticking, if you are using a pressure cooker. 3. For an extra taste, you can add 1/4 – 1/2 cup thick coconut milk or 2 tbsp cashew paste (soak 8 – 10 cashews in warm water for an hour, grind with little water in the small jar of a mixie) , once the curry is done. Cook for a few minutes at low heat and switch off. 4. Ground onion will taste bitter, if left outside for a long time. So try to use it immediately after grinding. Delicious and mouthwatering curry. Excellent preparation. Thanks a ton for your feedback and for promoting our blog 🙂 Great to know that you enjoyed this dish.. I also love coconut slices in nadan chicken curry. This is my Mom’s recipe and she usually makes this for biriyani, thats why I haven’t mentioned coconut slices in the recipe. Regarding your question, I dont know of any easy method of frying the onion paste. Microwaving sounds like a good idea. Maybe you can give it a try next time.. I am going to try this out. I have tried “Varutharacha kadala curry” from you blog and it came out excellent. The taste was very similar to the thattukadas in Trivandrum, where I come from. I have been trying so long to get that taste with kadala curry but never succeeded. Thank you Maya for sharing all these wonderful recipes. Thanks a lot for taking time to write your comments. Really happy to know that you both enjoyed our recipes. Please keep visiting..
You’re welcome, Sarika 🙂 Great to know that you enjoyed this dish. Thanks for your feedback. I tried out your egg curry with potatoes a couple of months ago when i was desperately searching online for good kerala recipes. My husband loved the dish and ever since i’ve tried numerous recipes from your blog and they’ve all been just yummy! I still refer to your blog for my day to day cooking recipes. A BIG thankyou! Trying out this recipe today. And i am sure it’ll be as yummy as the previous ones! Thank you so much for your lovely comment, Aparna. Really great to know that you love our recipes. Hope you enjoyed this nadan kozhi curry too..Please keep visiting! Thanks Maya for ur recipes, I love them. I have tried several of ur recipes and all have come out well. Yesterday cooked nadan kozhi curry for my guests and everyone loved it! There is one shortcut that I did, I microwaved the grounded onions for 3 minutes in a plate ( my father’s tip) before frying it with other ground ingredients in no. 2. This reduced the frying time to 15 min. Thanks a lot for your comment, Nisha! Really happy to know that everybody enjoyed this nadan kozhi curry. Thanks for the great tip too.Will keep it in my mind when i make this recipe next time. This dish is simply superb, I was waiting for a nadan chicken curry reciepe for long time. Thanks for your feedback, Dileep! 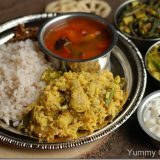 Great to know that you enjoyed this dish…Kappa puzhukku sounds like a great combo for this curry..Yum! Made it and it was perfect! Such an easy recipe too! it is very simplen easy way of making chicken curry..tried n superb..thank u.. Tried this recipe came out really nice & spicy. This despite reducing the green chiilies from 6 to 4 numbers and also the quantity of red chilly ( 1 tsp each of chilly powder mix). Thanks. I made biriyani with this curry and it came out soo good. thanks a lot..! You’re welcome! Great to know that you enjoyed it..